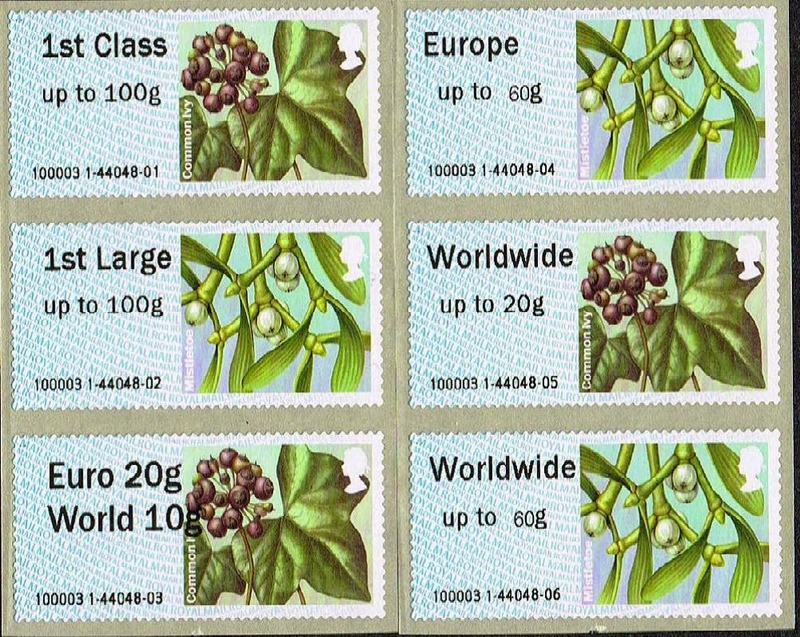 I reported in the middle of November on the Post and Go error at Farringdon, in which the blue Winter Greenery stamps were loaded into their Wincor-Nixdorf machine, producing 1st class to Worldwide 60g on Mistletoe and Ivy stamps with single phosphor bands. It seems that it was a case of both The Holly and The Ivy from supplies department as both designs were sent to all Post and Go offices including the few remaining Wincor offices (although Perth PO maintain that they only received the Ivy- 2nd class - rolls). Earlier the (solo) Remembrance Poppy stamps were loaded into one NCR machine at Norwich in both 1st and 2nd class slots. 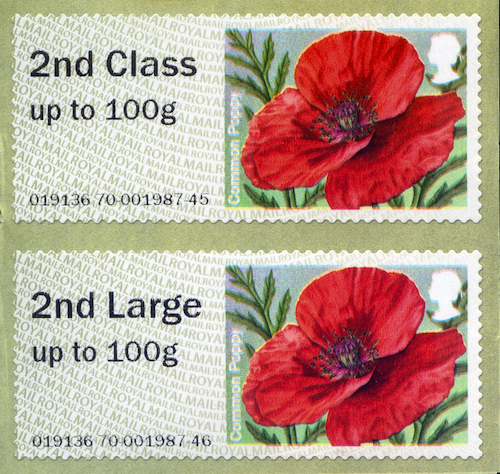 It was several days before this was noticed by a collector, and the '2nd class' roll was quickly used to produce Collectors Sets (ie pairs: 2nd class and 2nd Large) and a few 2nd class Open Value stamps. How many had already been used by the general public and for what services is impossible to know, but it will be worth looking out for them in kiloware. Two more cases of 2nd class printed on the wrong stock have now appeared on Ebay. Firstly on the ivory machin head (auction 351255246755) and on the Union Jack (auction 231422962812). Unfortunately, some branch staff who deal with the machines are under the belief that it’s what is printed by the machine which determines the class of service and the manufacture of the labels is of no consequence. Some of the offices in my area of London are running short of labels and are finding hard to get sufficient stock. So far Haywards Heath (Spring Blooms), Wood Green (undated Machin), Maidenhead & Cardiff (Symbolic Flowers), Windsor (Machin MA13), Norwich (Poppies) and the Union Flag (unidentifiable branch) have placed them in the 2nd class Printer. St Johns (Leeds) (and possibly Spring Gardens) used the 2nd class Machin in the 1st class printer. So far only those which have converted from Wincor-Nixdorf machines to NCR seem to have done this. Do you know what year code there is on the Union Flag (branch no ?) used 2nd class, and on the 2nd class used as 1st class? Thanks. PS: If you have any pictures of these please send them to ian@norphil.co.uk so that they can be used in the forthcoming Post and Go Catalogue. Many thanks. And now poppies from Lowestoft (eBay item number: 161541506028) with the Robin (eBay item number: 231431010861) add to the growing list. A lot of people seem to be referring to 1st Class on 2nd Class stock and vice versa as errors. I think the term 'mistake' is more appropriate! Psychologically, using the term “error” triggers the “I must have one” instinct whereas the use of “variety” triggers “I can do without it”. Whether it’s human error or authorised use due to lack of stock, some will always try and part collectors from their money using spin. That's one way of looking at it. But I think most collectors are cleverer than that. They know what they want, they know what they can afford. And they can make up their own minds - with sufficient information - as to whether the various stamps on offer are worthy of consideration or artificially contrived by some means. The evidence we have, for example, proves that the 2nd class Poppies from Norwich and the 1st class blue Winter Greenery from Perth were absolutely above board. Despite that I know people who have bought the first, but not the second. People only use the word error because the internet works by search words, no point in using 20 different words when 1 gets near to the point. In your post on 16th Dec above at 11.04 you mention the forthcoming P&G catalogue - is this now in preparation? A collector is working on it - and I know that several other collectors and dealers are working on their own lists. When the first stage draft is completed I envisage it will be sent to other knowledgeable collectors/dealers to sort out any glitches and typos. I would think spring 2015 is the earliest we can expect it to be available for download. Our own Machin list started as a spreadsheet back in 2011 or earlier, and took several months of revisions during 2014. The Basildon Philatelist (journal of the Basildon PS) reports that they have two NCR machines replacing one Wincor-Nixdorf.